They chose to paint pictures, and the entire energy of their natures was concentrated upon this one thing. Practising the art, day after day, month after month, year after year, they acquired a wonderful facility. They knew the history of art—its failures, pitfalls, and successes. 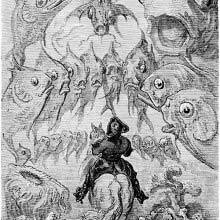 Illustration by G. Doré for Orlando Furioso. They knew the human heart—they knew what the people wanted and what they didn’t. They set themselves to supply a demand. And all this keenness, combined with good taste and tireless energy, would have brought a like success in any one of a dozen different professions. And these are the men who give plausibility to that stern half-truth: A man can succeed in anything he undertakes—it is all a matter of will. 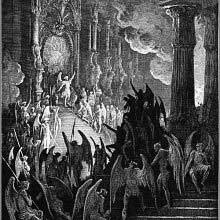 But you cannot count Gustave Doré in any such category. He stands alone: he had no predecessors, and he left no successors. We say that the artist has his prototype; but every rule has its exception—even this one. Gustave Doré drew pictures because he could do nothing else. He never had a lesson in his life, never drew from a model, could not sketch from nature; accepted no one’s advice; never retouched or considered his work after it was done; never cudgelled his brains for a subject; could read a book by turning the leaves; grasped all knowledge; knew all languages; found an immediate market for his wares and often earned a thousand dollars before breakfast; lived fifty years and produced over one hundred thousand sketches—an average of six a day; made two million dollars by the labor of his own hands; was knighted, flattered, proclaimed, adored, lauded, scorned, scoffed, hooted, maligned, and died broken-hearted. Surely you cannot dispose of a man like this with a bon mot! Comets may be good or ill, but wise men make note of them, and the fact that they once flashed their blinding light upon us must live in the history of things that were. An Alsatian by birth, and a Parisian by environment, Doré is spoken of as of the French School, but if ever an artist belonged to no “school ” it was Gustave Doré. His early years were spent in Strasburg, within the shadow of the cathedral. His father was a civil engineer,—methodical, calculating, prosperous. The lad was the second of three sons: strong, bright, intelligent boys. In his travels up and down the Rhine the father often took little Gustave with him, and the lad came to know each wild crag, and crowning fortress, and bend in the river where strong men with spears and bows and arrows used to lie in wait. In imagination Gustave repeopled the ruins and filled the weird forests with curious, haunting shapes. The Rhine reeks with history that merges off into misty song and fable; and this folk-lore of the storied river filled the day-dreams and night-dreams of this curious boy.